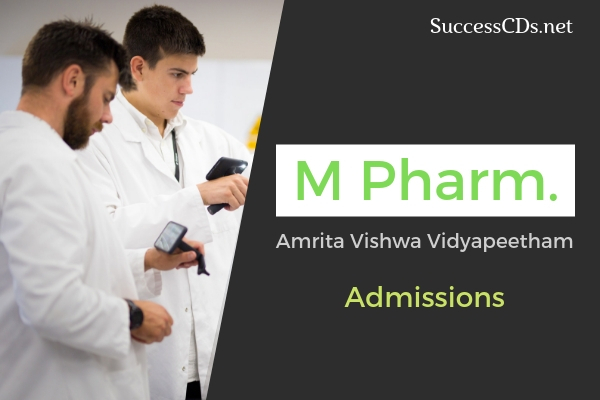 Amrita Vishwa Vidyapeetham M.Pharma, Pharm.D Admission 2019 - Amrita Vishwa Vidyapeetham, Kochi invites applications for admission to two-year Master of Sciences of Pharmacy (M Pharm) and 3 years (2 years of studies plus one-year internship or residency) at Amrita Health Sciences Campus and Doctor of Pharmacy (Pharm D) Pharmacy Course for the session 2019. Pass in B. Pharm degree from an Institution approved by the Pharmacy Council of India (PCI) with atleast 50% marks for all the subjects of B.Pharm course from second year to fourth year. Preference will be given to GPAT qualified candidates. Candidates with valid GPAT score card, once admitted to M.Pharm are eligible to receive monthly stipend as per AICTE norms. Eligible candidates will be invited for a personal interview. Selection will be made on the basis of academic scores and performance in the interview. *** Fees mentioned above are at current levels. Institution reserves the right to revise the same at any time without notice.